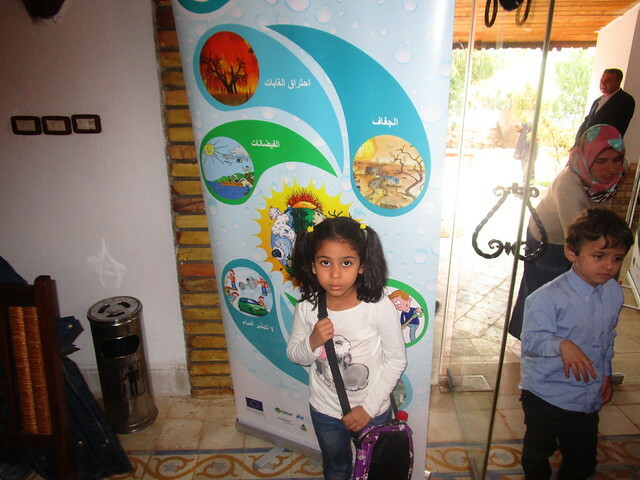 BeWater trains Tunisian youth NGOs to address the challenge of sustainable water resources management under climate change constraints. As a follow-up to its involvement with youth stakeholders in the Rmel River Basin in the Tunisian Province of Zaghouan, and the consultation workshop held there on July, 31st, with local youth participation, under the thematic “Boundaries and guidelines for a committed and active involvement of youth in sustainable water resources management and the fight against climate change”, the BeWater Project made further steps in the region on that front: BeWater Consortium partner, GWP-Med, along with Consortium partner INRGREF, held a very interesting and successful training for youth NGO members on November, 13th-14th, bringing together 30 youth stakeholders active in water resources management, from different Tunisian regions. Both the July consultation workshop, as well as the November training, were held in the framework of the project "La Jeunesse Francophone pour l'eau" [Francophone Youth for Water], a joint initiative of the Global Water Partnership (GWP) and the Office Franco-Québécois pour la Jeunesse (OFQJ), with the support of the French Ministry of Foreign Affairs, aimed at raising the young water experts’ voice in nine francophone countries with regards to water management and food security under climate change stress. This initiative pursued to gather recommendations on the topic in a youth-led white paper, recently finalised and presented during the United Nations Climate Change Conference COP21 in Paris, France, in early December 2015. Youth representatives from all nine countries travelled to Paris to discuss the white book recommendations with policy makers, among which Ms. Meriam Ben Zakour and Mr. Ahmed Nabli from Tunisia, who assisted both the BeWater consultation workshop and training. The two events served, among others, to enrich and validate the Tunisian input to the white book, following an extensive work done by GWP-Med during the previous months, including desk research analysis, national and local youth stakeholder mapping, preparation of questionnaire and subsequent questionnaire survey focused on the stakeholders’ point of view, data analysis and evaluation. The organisation of the November training was included in the action plan agreed upon during the July consultation, given the limits identified as faced by youth to efficiently be part of the decision-making process, among which the lack of collaboration between civil society organisations, as well as the limited access to information and knowledge transmission. In this framework, this national training dedicated to youth stakeholders offered the opportunity to review different measures for a more active youth involvement, mainly focusing on the reinforcement of the NGOs’ capacities and the level of networking between them, the sensitization of the wider public, the facilitation of an enhanced involvement of regional administration institutions, as well as of access to the needed information, and the financing of dedicated youth actions. As part of the national training, a field trip was organised to the Rmel river basin, during which participants discussed local water management challenges, the institutional framework and relevant national policies. Moreover, participants discussed additional opportunities for Integrated Water Resources Management, and stressed, on the one hand, the important role of sustainable development to address climate change impacts, and on the other hand, the active role that NGOs can play in this process. Participants were also invited to a collective reflection on the potential establishment of a Tunisian youth NGO network according the example of Water Youth Movement and further youth initiatives on water at national and global level, as presented during the training by Mr. Bart Devos, outgoing president of the World Youth Parliament for Water. Moreover, they sought to concretise the recommendations for an enhanced role of civil society in creating job opportunities for the young people in the water sector that was highlighted as a key issue for follow-up. GWP-Med is currently building on the training outcomes to come up with the most appropriate proposal for further activities under BeWater during 2016, including a dedicated national workshop on youth and employment in the water sector, an issue very much of interest to GWP and GWP-Med as well, given the recently launched GWP strategy for youth involvement. Further actions will include organizing communication and awareness-raising activities aimed at the wider public, as well as more specialized audiences, such as school students.